The Port Said Criminal Court postponed on Monday the trial session of 51 defendants in the case known as the “Port Said prison clashes” to 3 October, to continue hearing defence witnesses. The session was held at the Police Academy, and headed by Judge Mohammed Al-Saeed. The court decided in a session held last August to postpone the trial of the defendants to 13 and 14 September, to continue reviewing the rest of the evidence, state media reported. The defendants are accused of killing police officers Ahmed Al-Balky, Ayman Abdel Azim and 40 others, as well as injuring over 150 others on 26-28 January 2013. Police officers’ testimonies in previous trial sessions indicated that gunshots were directed at the prison. One witness, a Central Security Forces officer, stated that “masked individuals” among the families present outside the prison were firing gunshots, which led to his injury. 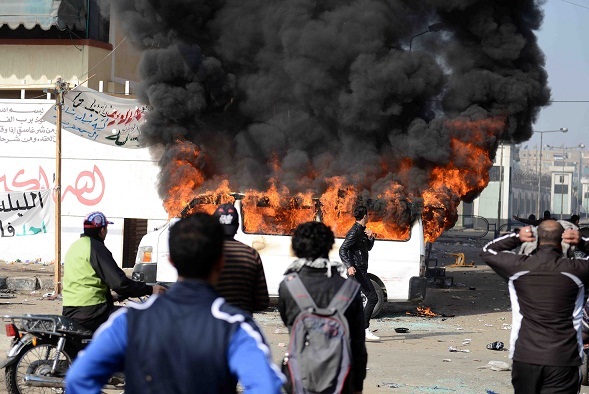 Clashes marred the Port Said governorate for three days, starting in January 2013, after the verdict in the “Port Said Massacre” case was released. In the case, 21 were sentenced to death for their role in the death of 74 football fans during a match in February 2012 between Al-Ahly and Al-Masry club. Angry protesters and the families of prisoners gathered at that time outside the Port Said prison where the prisoners sentenced to death were kept. They were accused of attempting to break into the prison. The army surrounded the prison with 10 armoured vehicles, deployed a tank at the entrance, and implemented a security plan for vital installations in Port Said. The city then descended into violence, as protesters also broke into a police station east of the city and surrounded the Al-Arab police station. Following the incident, former president Mohamed Morsi declared curfew in the Suez Canal governorates, which was defied by many citizens.